From left are commissioners Kelly D. McConkey (Vice President), Mike Hart, Thomas “Tim” Hutchins (President), Steven R. Weems and Earl “Buddy” Hance . 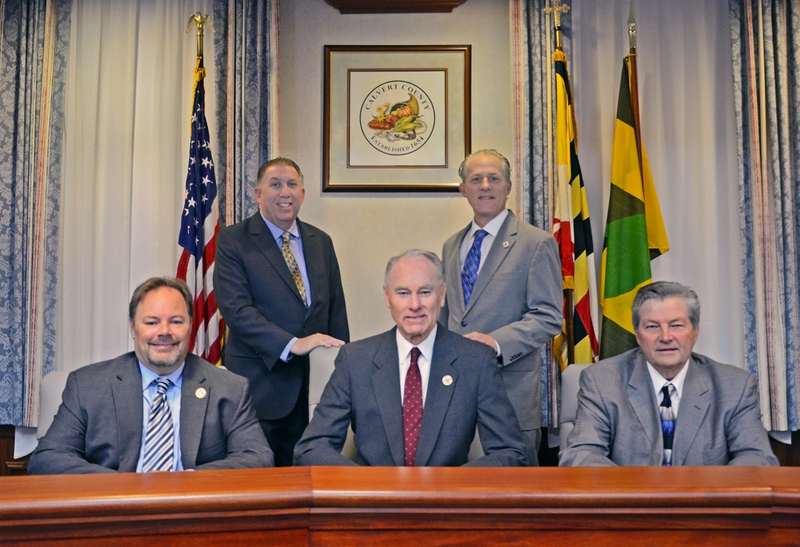 Board of County Commissioners meetings are held Tuesdays at 10 a.m. in the Commissioners' Hearing Room, located in the Calvert County Circuit Courthouse at 175 Main St. in Prince Frederick. Meetings are open to the public and generally last the business day. In addition, the board holds evening meetings when necessary. Time and place of evening meetings are advertised in the local Calvert County newspapers. An agenda for the weekly meeting is published the Thursday prior to the Tuesday meeting. The weekly Board of County Commissioners meetings can be viewed live in the Meetings on Demand section of the online Media Center. Here you can also find an archive of meeting agendas, meeting minutes and video recordings of past meetings. "Beginning with the general election to be held in Calvert County in November 1978, five County Commissioners shall be elected by countywide vote. Beginning with the general election to be held in Calvert County in November 2014: one County Commissioner shall be a resident of and shall represent the first election district of the County; one County Commissioner shall be a resident of and shall represent the second election district of the County; one County Commissioner shall be a resident of and shall represent the third election district of the County; and two County Commissioners shall be residents of the County and shall represent the County at large. Each candidate for the office of County Commissioner shall specify at the time of filing a certificate of candidacy whether the candidate is seeking to represent the County at large. Commissioners who are elected and qualify shall take office the third Tuesday of December following the election. Each Commissioner shall hold office for four years or until a successor is elected and qualified [Code 1981,§ 4-102; 1985, ch. 715, § 2; 2013, ch. 310]" See Code of Public Local Laws of Calvert County, Section 2-102. The officers of the board, president and vice president, are elected each December by a majority vote of the members of the board.